The Americans With Disabilities Act (ADA) prohibits discrimination based on disability. Title III of the ADA requires that businesses provide accommodations to persons with disabilities and access that is equal or similar to that available to the general public. What many property owners do not realize is that the ADA applies to landlords, even if the landlord delegates disability accommodation to its tenant. Failing to understand this obligation can create significant liability exposure for a property owner. At No Place Like Home Remodeling we understand that owning rental property has various challenges and sometimes hidden pitfalls. We always recommend being ‘proactive’ in the ADA compliance arena whether you’re the tenant or landlord. Do you own rental property, but you’re not really sure where to start as far as having a compliant building? Are you looking for ideas on how to better serve your disabled tenants? We’re here to help! Send us an email or call today for your free estimate! We look forward to hearing from you! You may be asking. 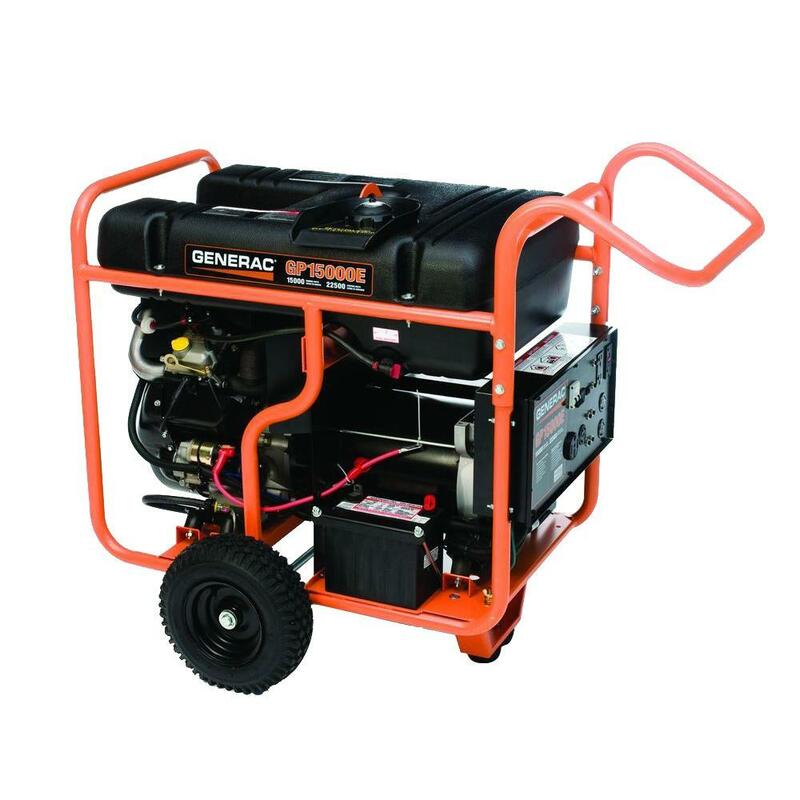 “where can I find something like that?” At No Place Like Home Remodeling we often deal with Home Depot’s 15,000-Watt Gasoline Powered Portable Generator with an OHVI Engine by Generac. 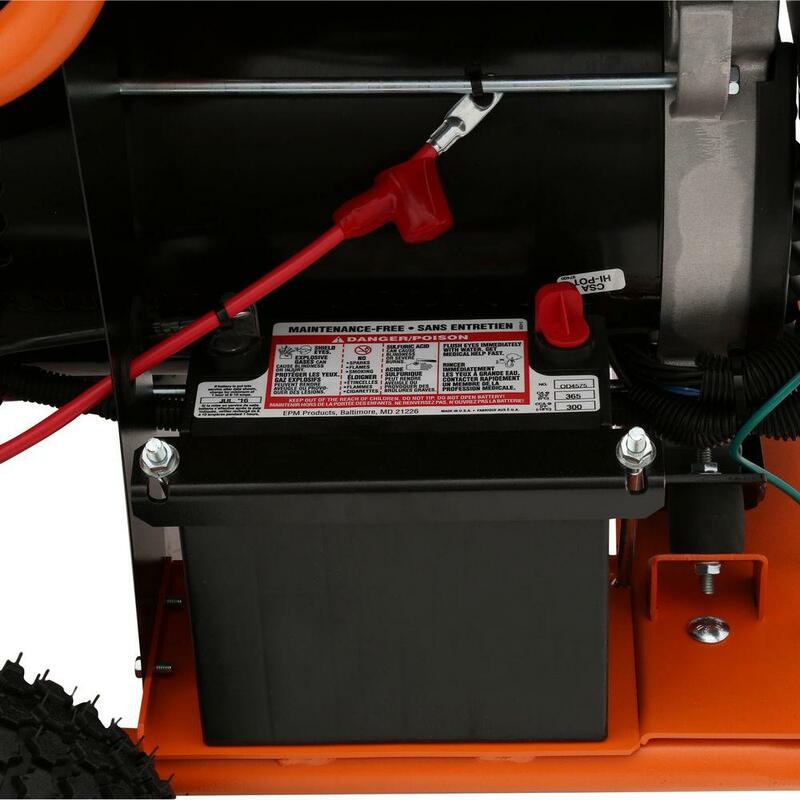 Featuring never-flat wheels, low-tone mufflers and low-oil shutdown, the Generac GP 15,000-Watt Gasoline Powered Portable Generator with an OHVI Engine offers quiet, dependable performance when you need energy. An idle control increases fuel efficiency and the included wheel kit and lifting eye allow for effortless transportation. 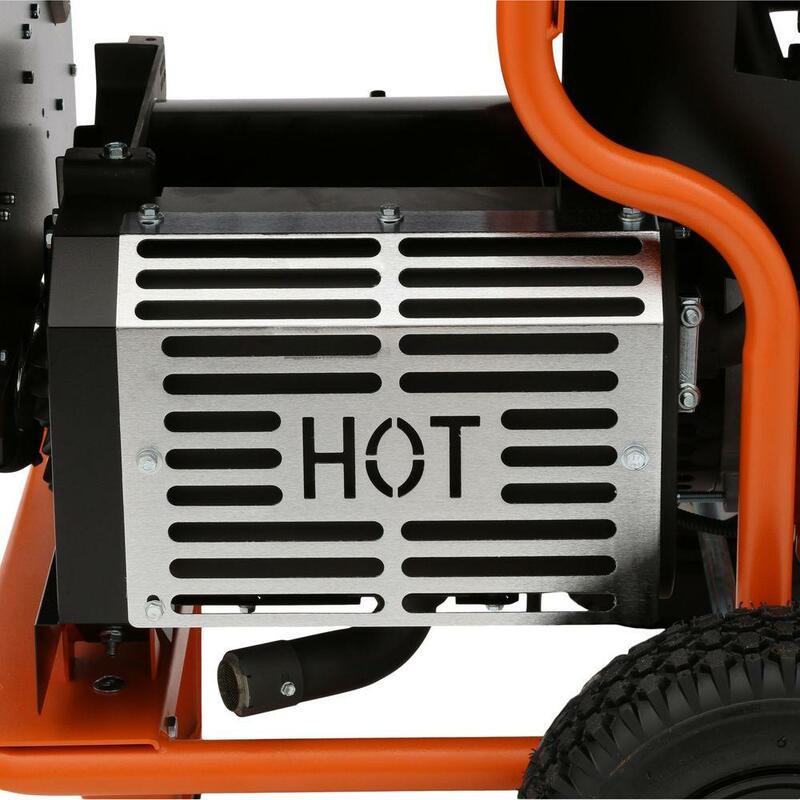 The super-efficient OHVI engine offers extended run-times for use at job-sites or for backup power sources. At No Place Like Home Remodeling we’re here to help you along the way as far as making a decision on whether a portable generator of this magnitude is worth it or not — especially when it comes to our senior citizens. There are some important, but basic questions we should all be considering when the danger of a long-term power outage exists. What about the need to keep food and perishables refrigerated? What if the only cooking source is an electric stove-top? What about staying warm or cool depending upon the weather conditions outside? One solution to these life-sustaining questions is the availability of a portable generator when an emergency strikes. In the past most decent standby power generators for keeping power running, was really not that affordable. Respirators and ventilators continue running. Recharge power wheelchairs and scooters. Oxygen, suction, and home dialysis machines continue running. It prevents frozen pipes from bursting by maintaining power to your hot water heater. It maintains power to your refrigerator, avoiding the expense of replacing spoiled food. It keeps theft at bay by allowing you to stay in your home to protect it. It eliminates costly cleanups and repair due to overflowing sump pumps. It keeps the water flowing for homes with private wells. Are you in the market for a portable generator but really don’t know how to go about setting it up? Are you tired of worrying about the seemingly annual power outage? Well, you’re in luck, that’s what we do at No Place Like Home Remodeling, we offer solutions to those types of problems. Let us help you — feel free to email or call us today, and we’ll address any needs you might have — after all, we’re here to help! Vinyl flooring is 100 percent synthetic material. In standard sheet vinyl and vinyl tiles, the base layer is usually fiberglass which is then coated in PVC vinyl and a plasticizer. The resulting sheet is printed and embossed with a surface print layer. Over this, one or more wear layers is applied, often a tough layer of "no-wax" polyurethane. Sheet vinyl is known as "cushioned vinyl" features a closed-foam lower layer. Vinyl plank flooring, also called luxury vinyl flooring (LVF), is also 100 percent synthetic, but in these products, the core layer is a thicker, multi-layer PVC vinyl. Luxury vinyl comes in planks or tiles, sometimes called LVP and LVT, respectively. There are glue-down and loose-fit versions available, but also interlocking styles that join together in much the same way as laminate flooring planks. 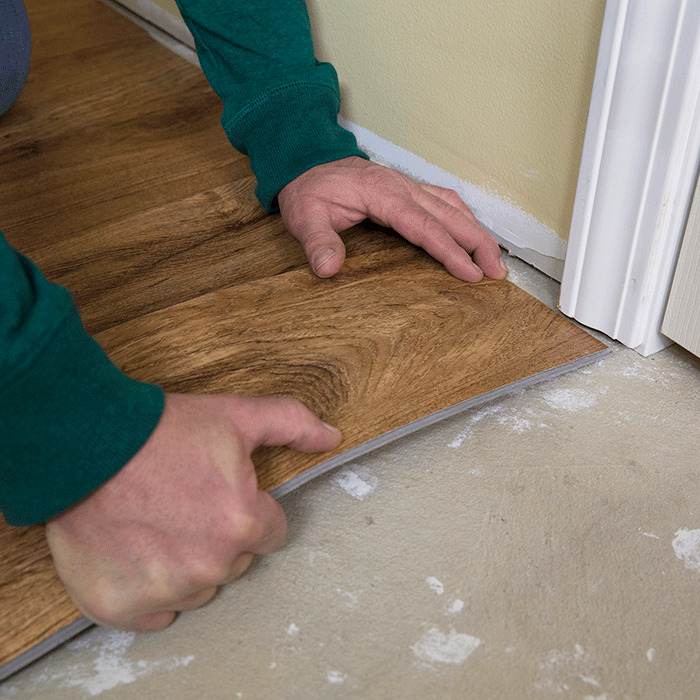 Prep your subfloor so that it is clean, dry and level within 3/16-inch change per 10 feet. 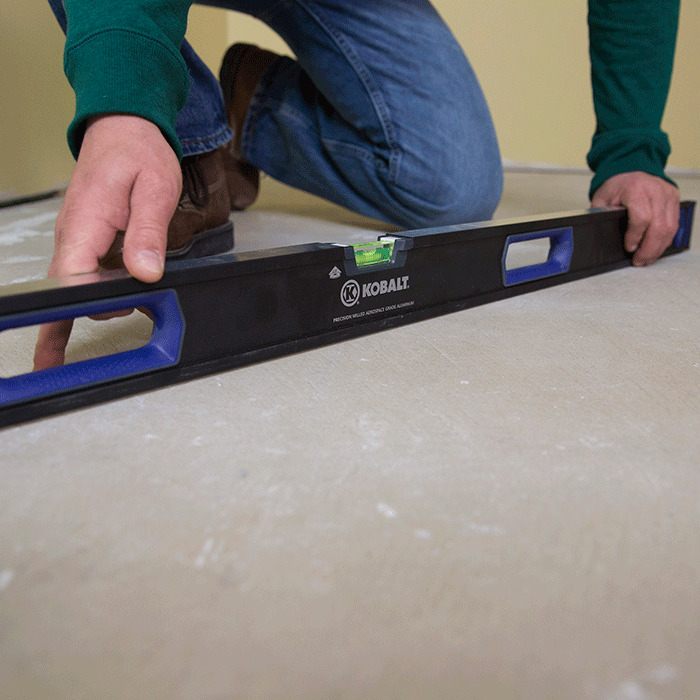 Use a self-leveler on low spots and / or sand high spots of wood or concrete. 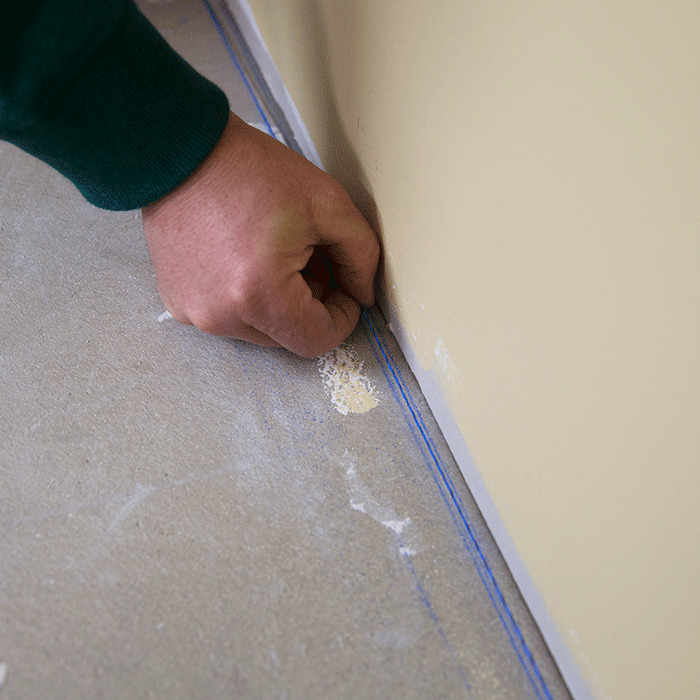 Do not sand vinyl flooring – it may contain asbestos. Self-leveler is available in powder and pre-mixed form and is used to create a flat, smooth surface in flooring projects. The strength of the product is similar to concrete. Self-leveler dries quickly, so work quickly. Mark the center of each wall and snap lines between them with a chalk line. 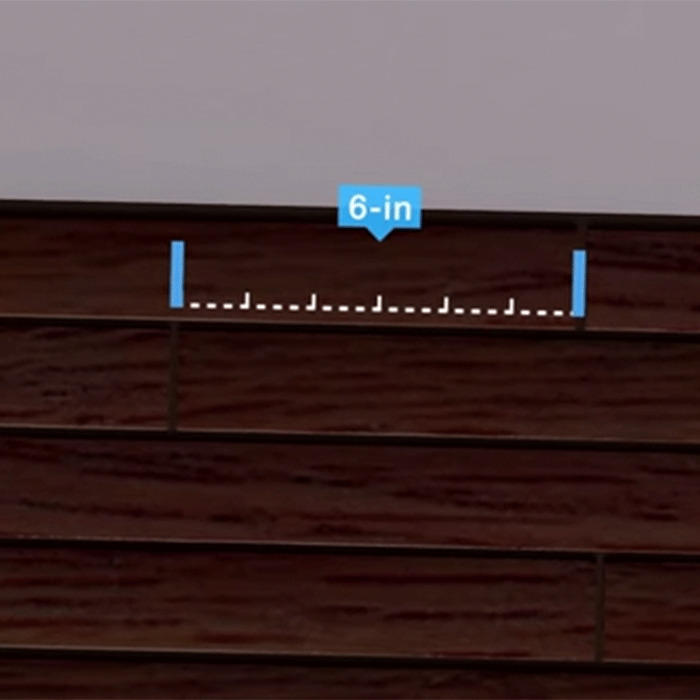 Measure from the center to the starting wall, subtracting the 5/16-inch expansion gap, and mark this distance at each end of the wall. Snap a chalk line between these two marks to get a straight line against the wall. Finally, calculate the width of the last row. If it will be less than 1/3 of a plank, cut about 1/3 of the plank off the first row for even starting and finishing rows. Score and cut the tongue off the first row of vinyl planks using a utility knife. Set the first plank in place on the starting line with the cut side toward the wall, maintaining the expansion gap. Hold the next plank at a slight angle against the previous plank's end and fold down to click it into place. To cut the last piece to fit, score with a utility knife and snap the plank. The joints must be staggered at least 6 inches. Measure and cut your first piece accordingly, using a cut end from the first row if necessary. Insert the tongue of the first piece into the groove of the previous row's first plank and rotate down to click together. To get under doorjambs, slightly bend the planks into place and use a pull bar or tapping block to lock the joint if necessary. 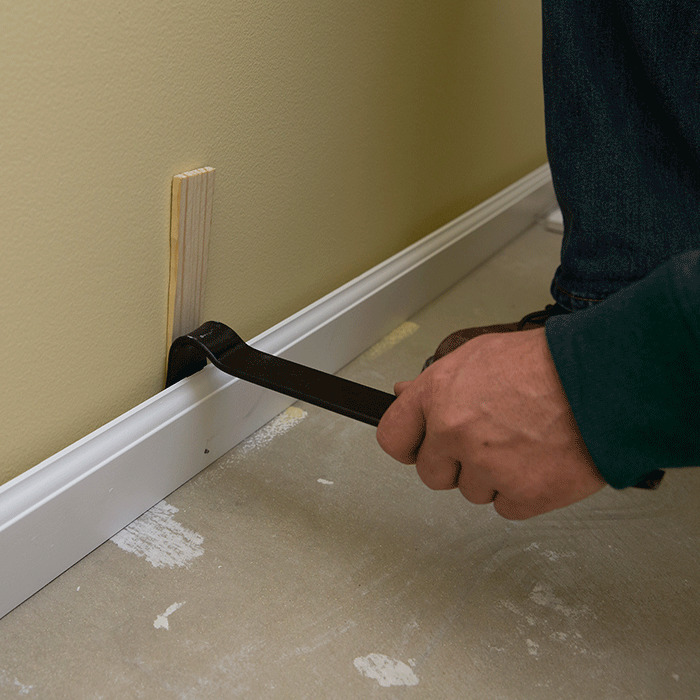 Replace the baseboards and add transitions and additional trim pieces, like shoe-moulding, if desired. 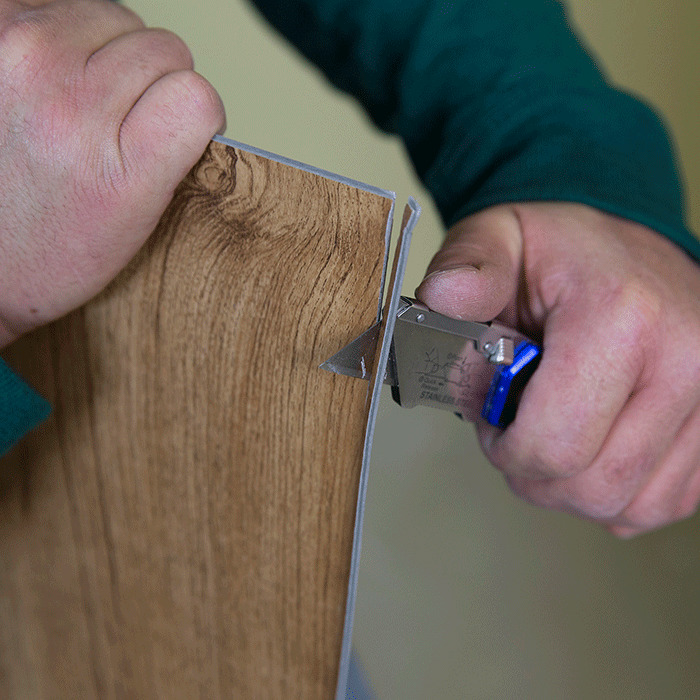 Be sure to nail the trim pieces to the wall, not the floor. 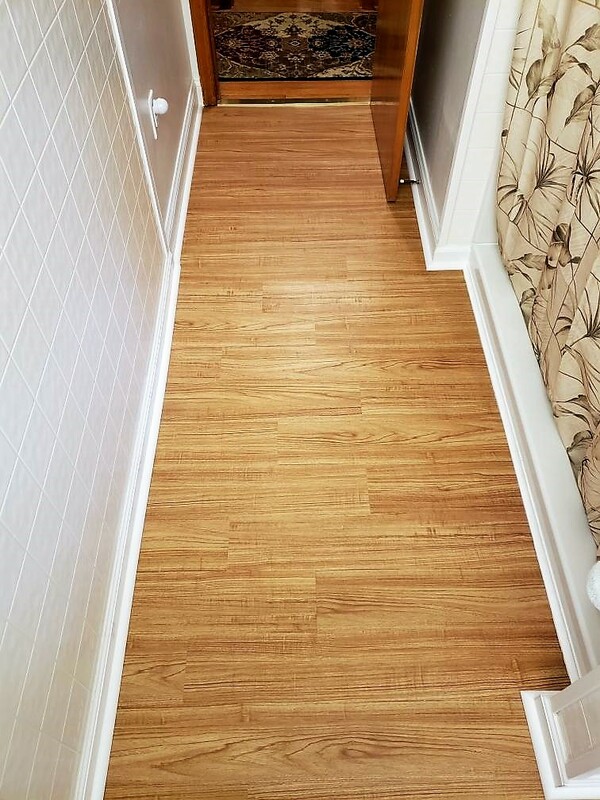 If you’re looking to modify your home with vinyl flooring, but you’re still not quite comfortable with installing the floor yourself — feel free to call or email with any questions, or if you’d like a free estimate from us please don’t hesitate to ask, because at No Place Like Home Remodeling, we’re here to help! Almost every room and area of a house can be adapted for universal design. Certain features should be used throughout the home such as light switches no higher than 48 inches so everyone can reach them, at least a 32 to 36-inch clearance for doors so wheelchairs can maneuver fully, and outlets no less than 18 inches from the floor. In addition, window treatments can be installed with a remote control device so shades don't have to be raised and lowered or pulled side-to-side, which can add strain — abundant lighting should be included since low-vision seniors may require up to five times the amount of light for average tasks. Besides a zero-step entryway at the front door, a side or back door from the house should be step-free as well. 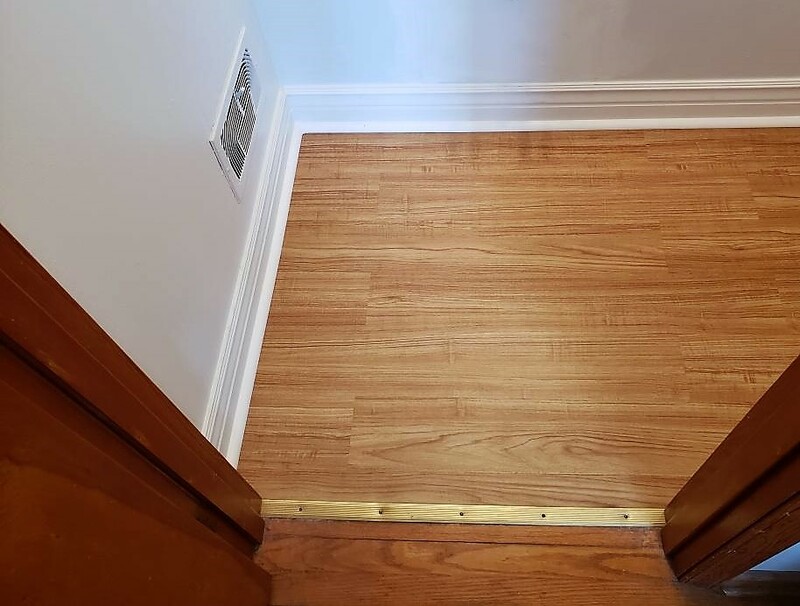 Door widths should be 36 inches rather than 2'6" for easy maneuverability; hallways should be at least 60 inches wide for a good turning radius. Walking paths should be wide enough for someone using a wheelchair or walker. Stepless entries make it easier and safer to gain access, whether the person is in a wheelchair or using a walker or cane. Cabinets should have easy to operate levers rather than knobs and the majority should be placed under the counter. Oven controls should be placed at the front of the range rather than toward the rear for less stretching. Counters should be at different heights to accommodate the different heights of users. If eyesight is poor, contrasting colors or materials can help someone differentiate different zones. A kitchen with mostly under the counter cabinets helps someone short and frail avoid having to step on a stool to reach high cabinets. If hearing is poor, flashing lights on appliances rather than bells can alert someone that dinner's ready. Grab bars to grasp whether using a toilet or getting into and out of a shower are essential and designs today look sculptural. If homeowners aren't yet ready to incorporate this feature they can have blocking installed behind walls, which will cut the expense later. Abundant lighting for overall ambiance as well as tasks is essential and special waterproof incandescent lights should be placed in the ceiling of a shower and over a tub for extra care. Showers should have a step-free entry and many tub models are available with a door that allows a person to enter. Both should be fitted with a seat, hand-held sprayers, anti-scald valves and niches to hold soap and shampoo at a level that can be reached. 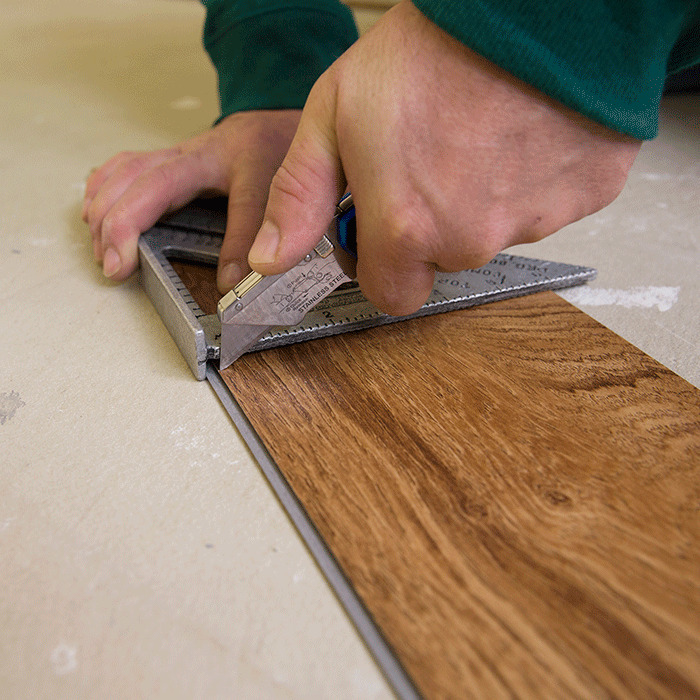 Floors should be slip-resistant wood, vinyl or tile with a lot of grout for traction. The height of counters should be flexible, but 34" allows someone in a wheelchair to pull up to a sink. That counter also should have a knee-hole for comfort. All cabinets and drawers should be fitted with levers rather than knobs. A comfort-height toilet model should be selected that's 2" higher than normal and easier to transfer onto from a wheelchair; a wall-flush valve makes flushing easier. Lighting modifications along a hallway can provide a clear path to a bathroom in the dead of night when eyesight is failing. Curbless showers with a bench allow someone to roll a wheelchair in and bathe. Front-loading appliances are easier to reach than top-loading models. At No Place Like Home Remodeling we focus on all the above and so much more — we’re here to walk you through the daunting process of Universal Design. Our team of Certified Aging-in-Place Specialist will breakdown all the necessary steps for you and customize a plan that 100% fits your needs. We want nothing more than to turn your home into a suitable, safe, living space. Give us a call today, or click-on the Contact Us tab and drop us a line. We usually respond within twenty-four hours (weekdays). We’re looking forward to serving you and putting your mind at ease when it comes to aging-in-place. As the name itself suggests, this shower grab bar is straight and can be installed to the wall, anywhere in the bathroom. Since these bars are fixed to the wall, they offer outstanding support which makes them perfect for people with stability issues. This type of bathtub support bars is ideal for maximizing the safety of the seniors and handicap people. 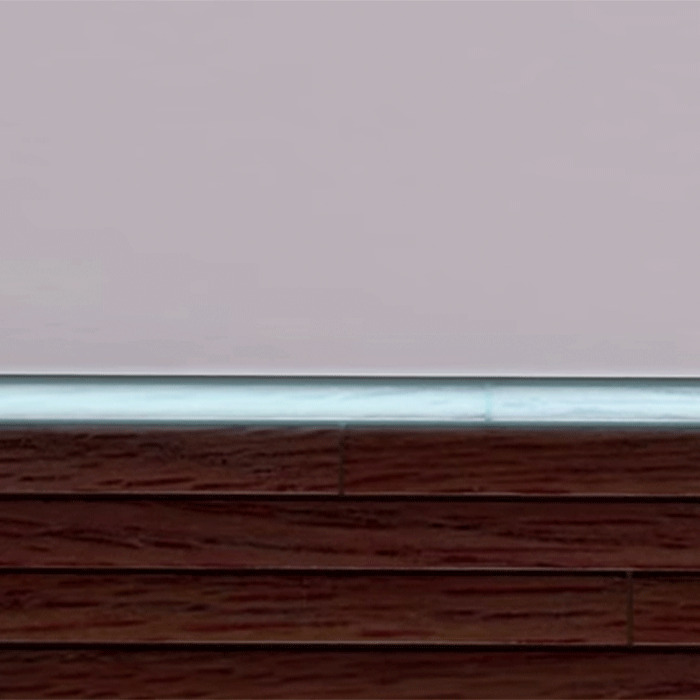 Since this bar is bent at an angle, it can be installed in a wet area, as it will give a secure grip to the user, while also allowing more flexibility as far as the geometry of the bathroom and shower is concerned. As you can imagine, this grab bar is fixed to the wall and the floor and offers a great deal of stability. 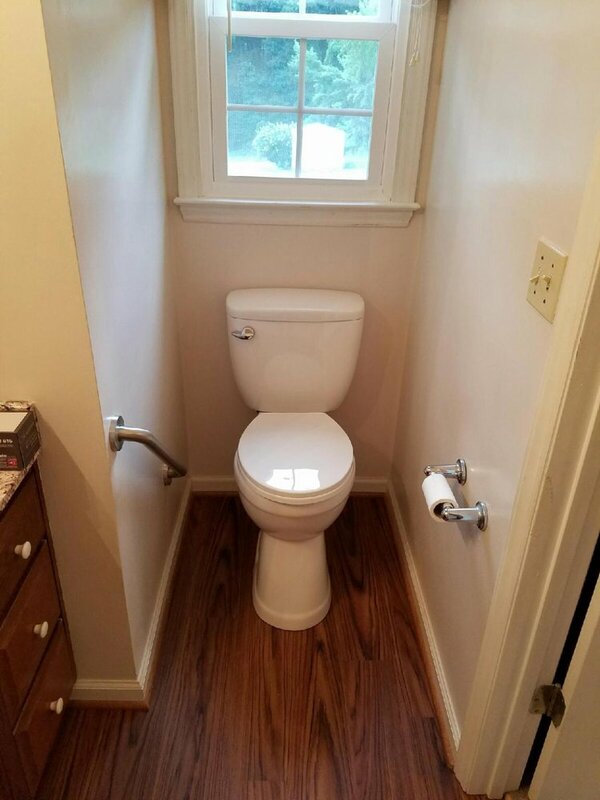 It’s usually installed next to the toilet and some models come with a second small support leg, to provide even more support. Not only does this type offers additional safety and firmness but it also adds a modern touch to a bathroom. There is a plethora of colors, sizes, and shapes to choose from. 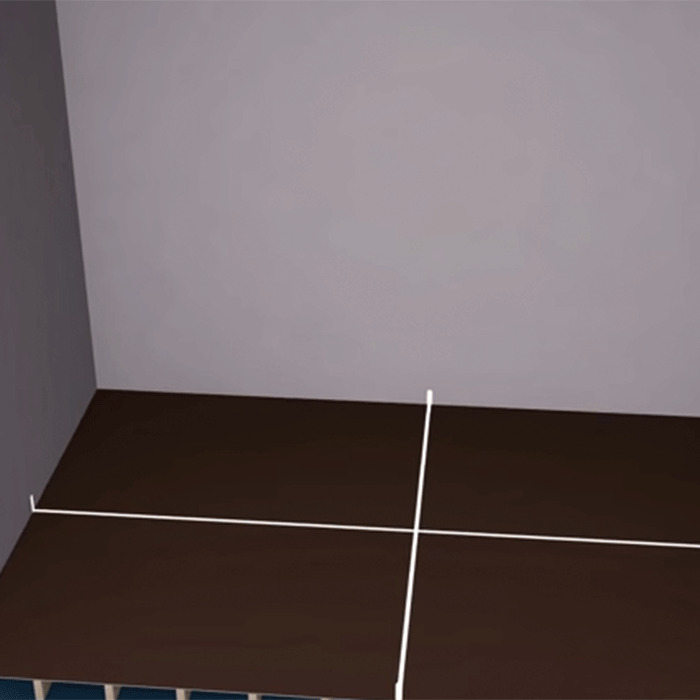 The first step is to determine where you need to place a grab bar. In other words, just sit on a toilet — and try to get up, in order to find out if you need to install toilet handicap bars. Similarly, step into the shower and see whether or not you will need additional balance and support when in the shower. Another step is to pick the perfect size and handicap grab bar height. Shower grab bars come in different lengths, from 18 inches to 48, so you will easily find the ideal one for your bathroom. In addition, you should think about the diameter. If someone in your family suffers from arthritis or simply has weak arms, you probably want to buy a grab bar with a small diameter. When it comes to the material, bathtub safety bar can be made of nylon, stainless steel, plastic, etc. Of course, stainless steel grab bars are most durable and are very secure. However, you can opt for any type, as long as it comes with a brushed or textured coating/finish, to provide you with a better grip. “Ideally you would want to install the grab bars onto wood studs, whether there is tile or not. However, most grab bars are not sized to precisely span the standard 16" center-to-center spacing of wall studs. Some installers will purchase longer bars... 18" or 24"... and install them at an angle so that each end aligns with a stud. However, all homeowners do not want this "askew" installation. Using toggle bolts, the folding fasteners commonly used on drywall... or, WingIts, are an acceptable alternative for one or both ends — you do not need to use toggles or WingIts in every hole... two per side (top and bottom holes) is more than adequate for most installations. If you can locate the studs (sometimes difficult through ceramic tile, even with a "stud finder"), try to attach at least one end of the grab bar to a stud. At No Place Like Home Remodeling we certainly empathize with you, yes it’s a lot of information to take in, along with all your added stress about discovering you need grab bars in the first place. Now, know this, we’re here to help, we’re here to breakdown all this information in person and make the step of buying and installing grab bars painless and easy. Don’t wait any longer — contact us today, start living with ease again! You’re only one grab bar away from feeling that safety and security! Seniors! fire is “fast, hot, dark, and deadly” - have you checked your smoke alarms LATELY? Fire is FAST! In less than 30 seconds, a small flame can turn into a major fire. It only takes minutes for thick black smoke to fill a house or for it to be engulfed in flames. At No Place Like Home Remodeling, we often look at the facts, we understand that checking your smoke alarms or proper exit ways in case of a fire can be, well, not ‘high’ on the priority list. But like most crucial things in life, it’s all about the smallest of details. ‘Wishful thinking’ is a fast way to get caught-up in some of the above scenarios. Do you need help creating a prevention plan — properly assessing your home for potential hazards? Do you need help creating an exit strategy in case of a fire? We would love nothing more than to sit down and work out a plan that’s right for you and your family. At No Place Like Home Remodeling, our Certified Aging-in-Place Specialist, can and will construct a plan that’s right for you! Leave a comment below with any questions or fill out the Contact Us form for a free consultation! We look forward to working with you! At No Place Like Home Remodeling, we’re not just Certified Aging-in-Place Specialist, we’re sons, we’re brothers, we’re family. Beyond any scope of work, we understand that everyone lucky enough to grow into their ‘golden years,’ will eventually need help beyond what their spouse or immediate family can offer. They’ll need ‘outside’ help if you will, someone that knows the trade, yet can sympathize with the recipient. We get it, it’s not always easy asking for help, we understand your sense of pride, being able to do ‘everything’ on your own is very important to you, it’s been that way your entire life, but we’re here to tell you, it’s okay, getting help is not a form of weakness, it’s a form of strength. Being proactive, preventing a fall for you or your loved one, can and will, eventually, save a life. “According to a 2016 study from the Centers for Disease Control and Prevention (CDC), nearly 200,000 Americans are treated in emergency departments for bathroom-related injuries annually. 1 in 3 people over the age of 65 fall each year, often at home, in the bathroom. Up to 80% of falls in the home are in the bathroom. Anyone can stumble and fall in the bathroom but having poor muscle strength and balance is strongly associated with increased risk. If you have a history of falls, the risk is even greater. How long does it take to complete a Tub Cut? How high will the threshold be after the Tub Cut is complete? How much does a Tub Cut cost? Is a Tub Cut cheaper than installing a walk-in shower? So there you have it, a Tub Cut conversion is well worth the money, and a much cheaper option for those on a budget and it can typically be installed within a day. See below for an example of our work here at No Place Like Home Remodeling (Before/After). Feel free to drop us a note, or contact us with any questions or comments on how to properly convert your existing tub. We’d love to hear from you, and remember, at No Place Like Home Remodeling we’re always here to help! Looking for bathroom STABILITY in the form of A grab bar? Read this blog post before you buy! “Two suction cups will secure this handle on the side of your bathtub or shower wall and allow you to get a good grip… It instantly installs using suction, without requiring holes, tools, screws or permanent installation." Use for stability only. Not intended to support full body weight. At No Place Like Home Remodeling, we’ve had several cases like this come up over the years. Before becoming our clients, in each case, they decide to go with the cheaper suction based grab bar option (which can be found on Amazon or at a department store like Walmart). It never really ends well, and we get the call to install a “permanent” stainless steel grab bar (which ultimately replaces the suction based one). But what’s the true difference? The true benefits of a permanent grab bar? Is it worth it? Glacier Bay 18 in. x 1-1/4 in. Made of Stainless Steel and built to exceed ADA standards. It can support up to 500 lbs. It is designed to work with the WingIts stud-less installation fastener, which can support up to 500 lbs. with no studs. Install this item near your toilet, tub or shower for added safety around the bathroom. Concealed Screw Grab Bar. Full product length 21.07 in. bar length 18 in. Why grab bars at all? “The ability to maintain your quality of life and a sense of independence is a value many share, especially seniors who are used taking care of themselves. However, studies have shown the risk of a serious bathroom injury due to a slip or fall increases with age. Rather than sacrificing your way of life or avoiding the shower out of fear of falling, consider installing a secure shower grab bar. We really hope this information has helped you! And at No place Like Home Remodeling, we understand that making decisions like these can be a daunting task. Feel free to contact us or leave a comment below and we’d be glad to answer any and all your questions! 1 in 4 U.S. adults – 61 million Americans – have a disability that impacts major life activities, according to a report from the CDC. Here’s the good news… No Place Like Home Remodeling… we’re here to help! Follow this simple step below and you’ll properly measure that step for the rise/run of your aluminum ramp. This step measures 8” in ‘rise,’ so, your total ramp ‘run’ (horizontally) would be 96” (8’) in order to keep your 1:12 ratio for ADA compliance. There you have it — this is a 96” (8’) suitcase ramp. The end result you are after. We certainly hope this bit of information helps — consider it your “quick start” guide to getting your life back after an injury! However, if you have something a bit more technical, like a stoop that has more than one step (which most do), or you’d like information about building a wooden ramp, feel free to leave your question/comments below about those topics or anything else that comes to mind. We’re here to help in anyway we can! Since April is Occupational Therapy month we thought we would share the important role OT plays in ensuring quality of life and safety in home safety for disabled individuals and those desiring to age in place; in their own homes. A brief history of Occupational Therapy...OT as a health profession got its start in the early 1910's, with it being officially recognized as a medical profession in 1920. By definition occupational therapy is the use of assessments and treatment to develop, recover and maintain the daily living and work skills of individuals with physical, mental and cognitive deficits. The focus of much of an OT's work is on identifying and eliminating environmental barriers to independence to and participation in daily activities. No Place Like Home Remodeling's on staff occupational therapist's role is to address all aspects of aging and quality of life for the older adult and disabled. With a focus on function, our OT strives to keep the client independent and safe, reducing healthcare costs associated with hospitalizations and institutional care. During a home assessment we will assess and identify needs associated with safe accessibility of multiple areas of the home to include entrance/exit of the dwelling, and all rooms our client uses to include outdoor spaces. Function and safety, to include optimal lighting, will be assessed in these living spaces- all with emphasis on quality of life throughout the client's lifespan. We proudly serve the Roanoke, Salem and surrounding areas. No Place Like Home is not just another remodeling company, we have a mission and passion to provide a service, to assist individuals in spending their life time where they are comfortable, where they thrive...in their home! We want to highlight a product that makes bathroom, specifically bathtub, safety an option, even on a budget. While we can all agree that the bathroom is often the most dangerous room in a home, at times, a full bathroom remodel is cost prohibitive. With the Safeway Safety Step, not only is the cost a fraction of completely replacing an existing standard tub into a walk-in tub, but it can be installed- job complete in 2-4 hours. Our Occupational Therapist, during a home assessment, would determine if the Safety Step is an appropriate option for you or your loved one. We will typically pair this with 1-2 specifically placed grab bars to create a customized bathtub to meet the safety needs of each client. To learn even more about our services provided and this particular product, please visit our website. What does a home assessment look like? What are the most important features to address? These are the top questions asked of us recently. The answer is three-fold; first, we must address safety- developing an accessible entrance/exit of the home; second, we ensure the client is able to meet basic hygiene needs- the bathroom can be the most dangerous room in the home (research indicates 80% of falls in the home occur in the bathroom); finally, ease of mobility in the home and basic comfort and desires. A recent ramp plan to enable a wheelchair bound client to return home to be with her family. When our Occupational Therapist and CAPS certified remodeling expert meet the client at their home, we will first address the means of entrance and exit of their home. We will develop an aesthetically-pleasing ramp that will fit the style of the house, or simply add handrails to existing stairs to improve safety; decreasing the risk of falls. The next area we will focus on is bathroom accessibility. Can the client maneuver through their home to access their bathroom? 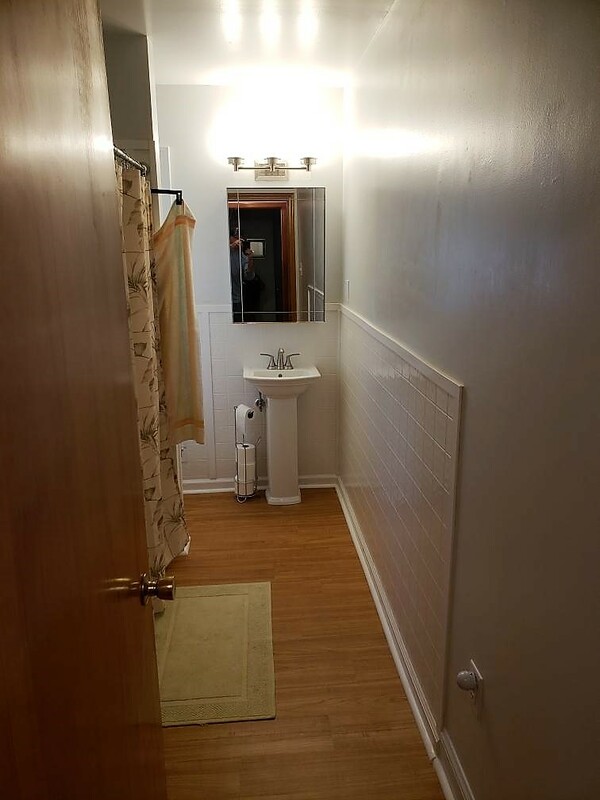 If wheelchair bound, does the width of the hall and width of the bathroom door allow for the necessary turning radius for the client to access the bathroom. Once inside, we will ensure the client can safely enter and exit the bathtub or shower. Are grab bars needed to add stability and safety with the transfer in/out and/or would a simple remodel or shower seat/bench improve accessibility and safety? How about the toilet? Is it the appropriate height to allow for safe transfer and would grab bars add the needed safety to decrease risk for falls and increase independence? Finally, is the sink accessible? If wheelchair bound, we will suggest a pedestal sink or cabinetry that allows room for the wheelchair to pull under and adequate sink access for the client. We also will ensure lighting is appropriate and glare-free based on client need. Mobility throughout the home is extremely important and pose potential hazards. We will recommend removal of small throw rugs as they highly increase risk of trips and falls. Raised thresholds are also a trip hazard and an easy fix. Thick carpeting can pose mobility problems for both walking and wheelchair bound clients. Kitchen accessibility is highly individualized based on client need, ability, and the level of independence required given their situation. Whatever the need, we will come up with a plan to optimize independence and safety. Adequate, low-glare lighting throughout the home is essential for safety. In summary, each home assessment is unique and individualized to each client to meet their needs and what is important to them. Our specialized remodeling team's goal is to maximize the client's safety, independence and overall quality of life through a specific plan developed with the client. CAPS... What is it and why hire us? Statistics indicate that every day, about 10,000 seniors turn 65 years old across America. In general, people are just living longer today ever before. For those who have or will develop a disability or handicap, regardless of age, many critical decisions and life choices must be made as these conditions progress... with one of the most important decisions being made about their home. Seldom are peoples' homes designed for them to comfortably live and stay there throughout their lifetime. Consequently, renovations and modifications are typically necessary in critical areas throughout the home, both inside and outside. The key to creating a usable, comfortable living space out of any home relates to the concept of Universal Design, also called Lifespan Design. Flexibility in Use: The design accommodates a wide range of preferences and abilities. Simple and Intuitive Use: Easy to understand design, regardless of skills or abilities. Perceptible Information: The design communicates necessary information effectively. Tolerance of Error: The design minimizes hazards and adverse results of accidents. Low Physical Effort: Design is efficient, comfortable, and minimizes fatigue. Size and Space for Approach and Use: Appropriate size and space are provided for approach, reach, manipulation, and use, regardless of user's body size or mobility. Ok, so now you may be wondering what does all or any of this have to do with CAPS, and oh yeah, what is it?? Well, quite simply, CAPS has everything to do with all of the above. CAPS stands for Certified Aging-in-Place Specialist. CAPS is a protected designation awarded to qualified individuals through the National Association of Home Builders (NAHB). This designation program teaches and reinforces the technical, business management, and customer service skills that are essential to for providing quality solutions for clients. We, here at No Place Like Home Remodeling, strive to achieve excellence in all phases of the remodeling or home modification process for seniors and the handicapped in the Roanoke, Virginia and surrounding areas, to comfortably age-in-place. As CAPS professionals, we have the answers to your questions. Our training has taught us the strategies and techniques for designing and building aesthetically-pleasing and barrier-free living environments. If you have been thinking about making your home more user-friendly and accessible, why wait? It's never too soon to plan for creating a more comfortable and worry-free home to suit your needs in the years to come. Don't delay; contact us today! Falls are the leading cause of accident-related emergency room visits and the primary reason for accidental deaths in the senior population. Statistics indicate that one-third of community dwelling individuals over the age of 65 fall every year. Twenty to thirty percent of these falls will result in moderate to severe injury, to include lacerations, hip fractures, and head trauma. These injuries can make it difficult to get around and continue to live independently. It is important to understand some common causes that can lead to the potential for falls. The top 5 causes are: 1) General decline in health: an acute illness or gradual physical decline due to decreased activity. Deficits related to vision, hearing, memory, and balance all play a role in increasing fall risk. Regular healthcare checkups are very important. 2) Medications: keep a full list of medications (to include over the counter) to be reviewed by your healthcare provider. Many medications have side effects of impaired balance and stability. 3) Post-Hospital return: the senior population has an increased risk for falls during a weakened state. This is particularly true following a surgery or significant medical event. 4) Living environment: small rugs, cluttered spaces, poor lighting, and stairs are just a few items that increase risk of falls in the home. According to the CDC, over 200,000 falls annually occur in the bathroom, making this potentially the most treacherous room in the house. 5) Fear of falling: the fear of falling again once a fall has occurred is significant with the senior population. This leads to psychological limitations resulting in limiting daily activities, thus loss of physical function. Preventing falls is crucial in maintaining the quality of life and independence of seniors in their home. Prevention includes: 1) Regularly scheduled medical appointments to review all medications, assess vision, hearing, and overall medical status. 2) Following any hospitalization, ensure proper assistance and care is available and provided during recovery period. This often includes post-hospital rehab services. 3) Stay active; keep moving. With physician approval, participate in gentle exercise, to include walking, water exercise, and tai-chi. 4) Assess environmental hazards, which include renovations or remodeling of living space. Provide adequate glare-free lighting, open and clutter-free walking space, and remove small rugs. Adaptations to the bathroom may be necessary, and may include: a walk-in shower/tub, grab bars, and raised/handicapped-height toilet. Why No Place Like Home Remodeling?? No Place Like Home Remodeling was birthed from two careers of knowledge and expertise with a vision and desire to make a difference in the lives of the senior and disabled population in the Roanoke, VA and surrounding areas. Our goal and mission is to assist in maintaining each client's quality of life and optimizing safety through individualized renovations and adaptations, enabling them to remain in their home. After all...there's NO PLACE LIKE HOME. Jen, the on-staff licensed Occupational Therapist, has spent the largest part of her 20 year career in the post-acute rehab setting. She has completed countless home assessments followed by the conversations with patients and families regarding necessary adaptations or renovations prior to planning a safe discharge home. With limited community resources with the expertise and skills necessary to turn to, often patients were left with difficult decisions regarding their future. Trent has 22 years experience with his family's home remodeling business. He is an Army Reserve veteran with over 17 years and serves as an engineer in vertical construction. As we initially began discussing the grand need I (Jen) experienced in the healthcare setting much too frequently, and the skills, knowledge and expertise we both brought to providing a solution, the idea of No Place Like Home Remodeling and Consulting Services began to become a reality. Trent took all the necessary courses to become CAPS (Certified Aging in Place Specialist) certified. He is also a licensed Class B Virginia contractor. Together, with our team, we believe we can make a difference in the lives of seniors and disabled individuals allowing them to maintain their independence in their home setting without sacrificing safety.